First, a confession. 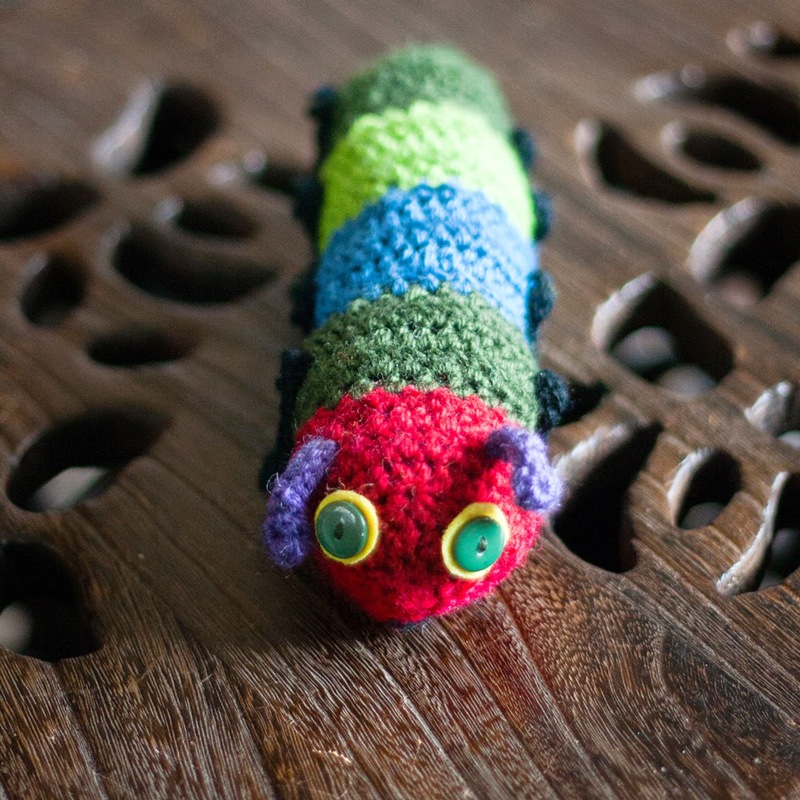 As a child, I never read The Hungry Caterpillar. I read lots and lots of wonderful books but it just wasn't part of my childhood. 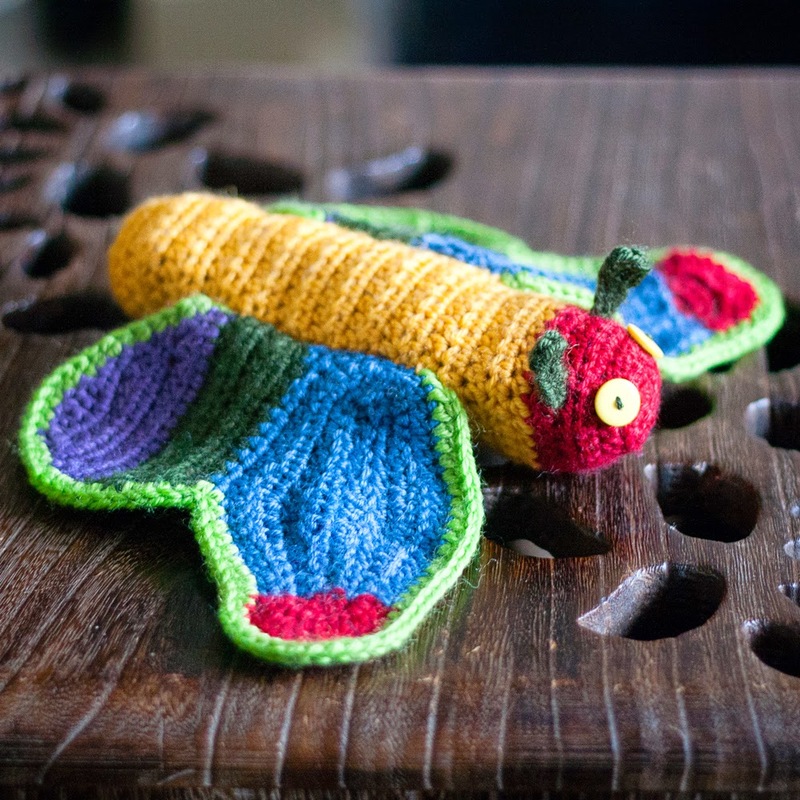 However, it is a part of my niece's, and so when I saw the Caterpillar to Butterfly Metamorphosis pattern on Ravelry I knew I had to make it for her third birthday in The Hungry Caterpillar colours. Doing this for the body was pretty straight forward. I couldn't exactly capture the beautiful colours in the book, but I think I got close enough for a toy. Pro-tip: Don't do like I did and try to crochet the legs in black at night. If you're anything like me you'd be much better off waiting until daylight when you can actually see what you're doing! The wings were much more of a challenge. 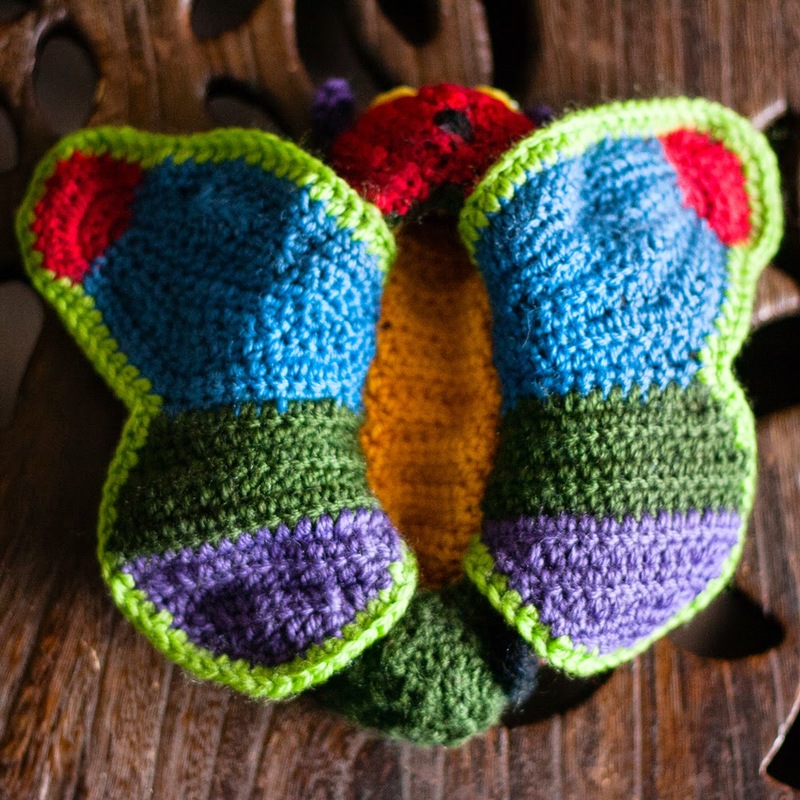 The wings in the pattern aren't the same shape as the wings in the book at all. I did think about trying to get them similar but in the end I tried to compromise and just use similar colours. It was straight forward apart from the red bit, which I had to think about and do over a couple of times to get it right, but even that wasn't too hard. The genius part of this pattern is the way it folds inside out. 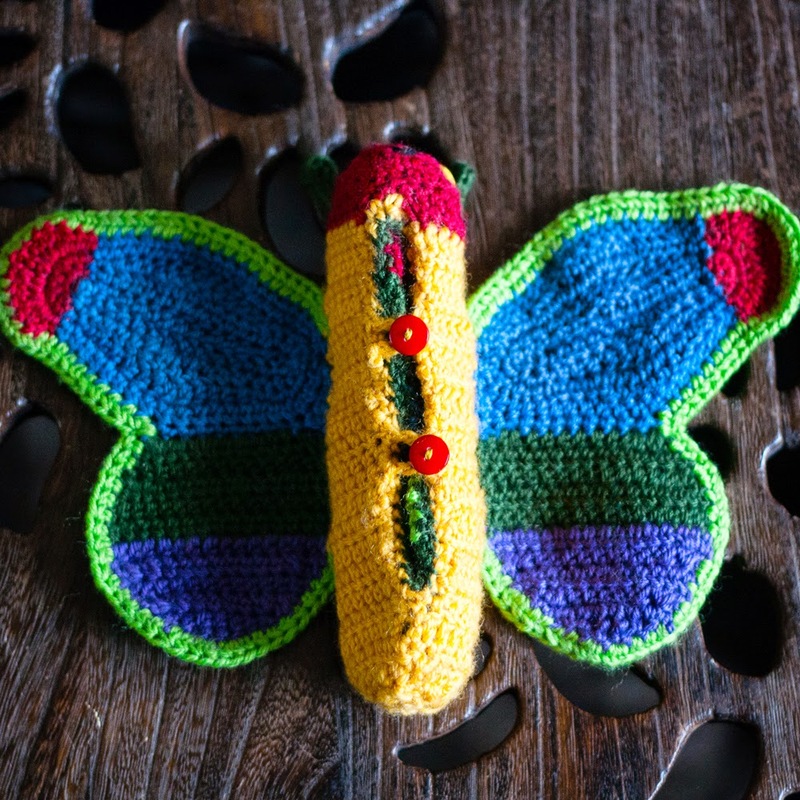 You basically make the caterpillar and the butterfly separately, put one inside the other and sew them together. I was worried that this might be tricky but it was easy- I got it right first time. The turning inside out process was a bit too difficult for my niece to manage by herself, but she did enjoy telling her mum to change it from one creature to the other! Should I make one too? Yes! 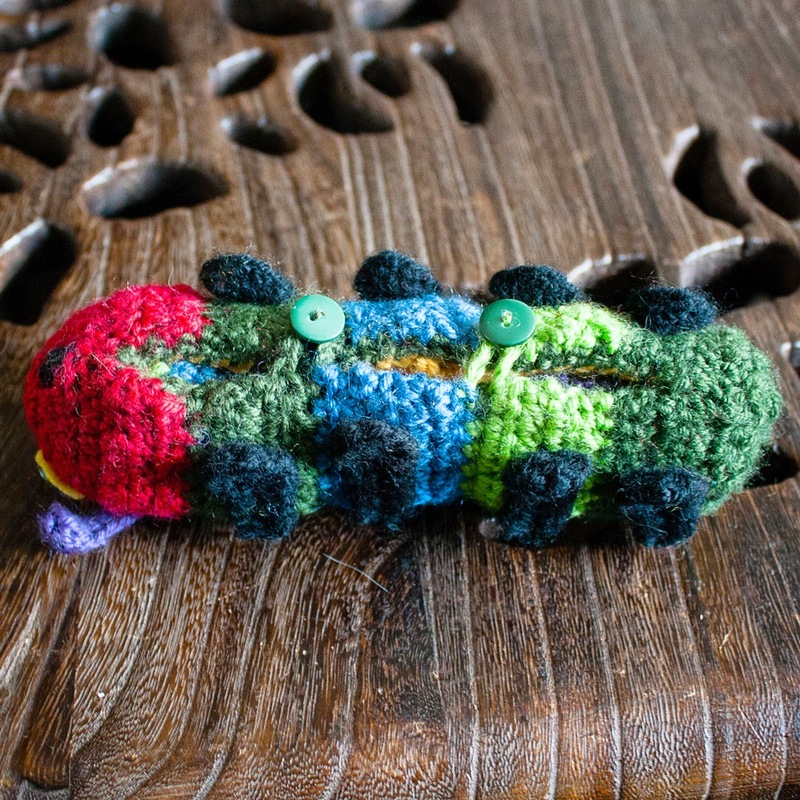 It's a lovely idea regardless of colours, and if you have a Hungry Caterpillar fan in your life you have to make one for them.